Revocation has a ripping new self-titled modern thrash album, and Madeline Quinn made a new video to promote it, posted at Bloody Disgusting. 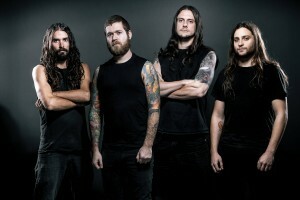 In the video, the band expresses a strong environmental message about fracking (or hydraulic fracturing) as well as dirty energy in general and its ill health effects.The band doesn’t appear in the video, which is cool (mixing a concept or a plot and clips of a band playing often doesn’t mesh well), although Revocation couldn’t resist showing a van with their logo on the side in a wall of fire. There’s been much written about the environmental damage of fracking, but there are debates as to how safe or unsafe it is, or whether it’s a good “alternative” to coal or other forms of dirty energy. A pair of eye-opening documentary films about fracking have come out: Gasland and Gasland 2, and more info on them is at the Gasland website. This entry was posted in Environment + Music and tagged environment, Relapse, Revocation, thrash metal, tour by Editor. Bookmark the permalink.